That’s not a Throne Speech, that’s a suicide note! …so someone said to me at lunchtime. Sometimes, you just have to laugh. Anyway. 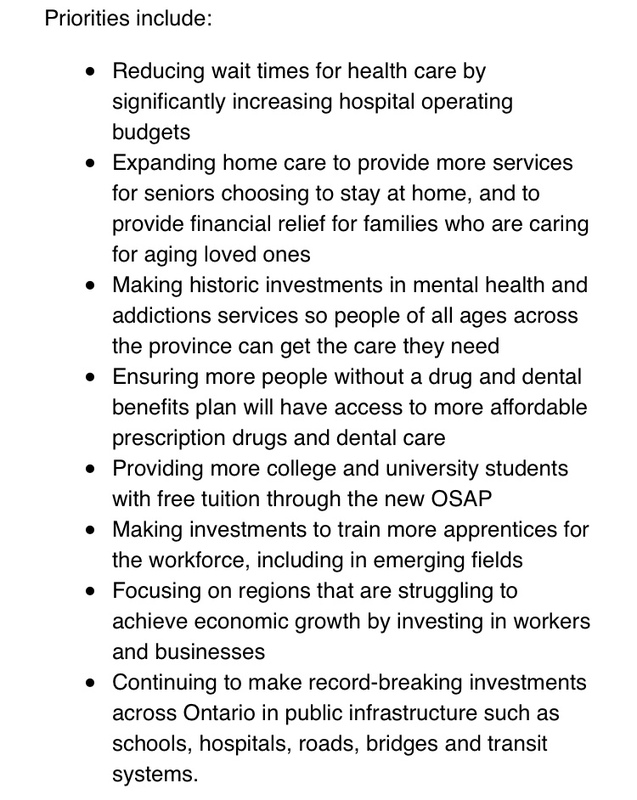 These are the Ontario Throne Speech “priorities.” If anyone can see a big re-election victory somewhere in there, drop us a line, okay? Would this be a bad time to ask Wynne for a 64 Chevy Impala? Candy apple red. Me, a 21 window, two tone VW microbus! Wait! Wait! Wait! I don’t know where I heard it, but I read it somewheres, how about: “Kathleen Wynn is the luckiest politician in Ontario”? I think it could catch on! #2: Take out “Expanding home care to”. Replace “aging loved ones” with “them”. #3: Take out “historic” (?) and everything after “services”. #4: Take out “to more affordable”. #5: Take out “more” and “free” (no-one will believe it”) and “new”. #6: Take out “Making investments to” and stop at “workforce”. #7: This one’s tough because it is almost stream of conscience. How about “Promote economic activity in marginal regions”? Nobody is going to believe you anyway. #8: Take out “Continuing to make record-breaking investments” and replace with “Invest”. Take out “across Ontario in public…”. (What the hell is private infrastructure?). The essay that has yet to be written is how the Trumps and Fords succeed by speaking basic English. Not saying, but for the million, I will reveal my sources. Taken together, it shows that your government cares. But as they say, they could cut income taxes and they would still likely be out of the door. It’s easy to “care’ when you are spending other people’s money. Taken together it shows that your government cares. But they could cut income taxes and likely would still end up out of the door.